Looking for that perfect set of dishes for your converted city loft? The City Plates Collections are a fabulous transit/ urban-inspiring set to adorn your sleek metal and glass dining room table. Choose from Collection 1 featuring Los Angeles, Shanghai, Cairo, and Berlin, or select Collection 2 with New Orleans, Washington DC., Las Vegas and Dubai. 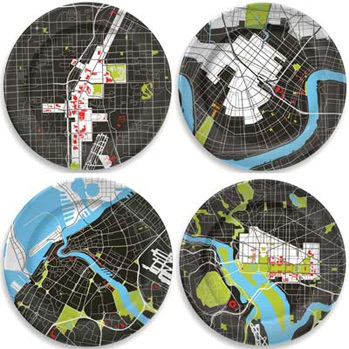 Featuring colorful maps and geographical inspiration, you can dine on this set of four for $200.